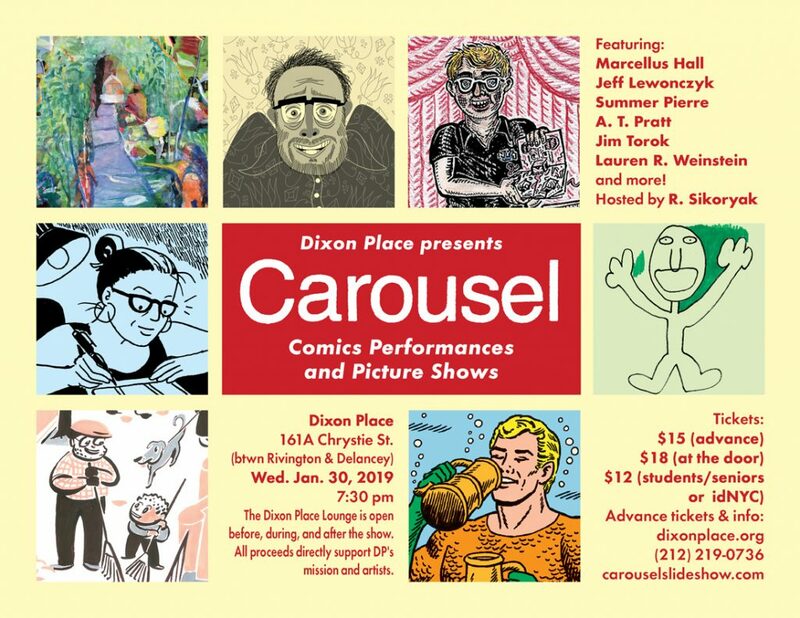 Comics Performances and Picture Shows, hosted by R. Sikoryak. Live readings and projected presentations of graphic novels, cartoons, and other visual art, presented by writers, artists, musicians, and voice actors. Marcellus Hall, Jeff Lewonczyk, Summer Pierre, A. T. Pratt, Jim Torok, Lauren R. Weinstein, and more! Jeff Lewonczyk﻿ is a recovering playwright and aspiring cartoonist who lives in Brooklyn. His children’s holiday comedy Bethlehem or Bust has been performed in schools across the country, and his illustrated travelogue “I Went To India, and All I Brought You Were These Lousy Cartoons” has been featured in publications ranging from Buzzfeed to the Hindustan Times. Visit his website at jeffisaweso.me. Summer Pierre is a cartoonist and writer living in the Hudson Valley. She is the author most recently of the graphic memoir All The Sad Songs (from Retrofit) and the autobiographical series Paper Pencil Life. Her work has appeared in TheNewYorker.com, PEN America, Upworthy, and The Comics Journal, among other places. A. T. Pratt is a cartoonist whose comics and other printed work often features tricks and special features such as fold-outs, pop-ups and peek-a-boos. He is also Chief Creative Officer of MrMiSocki, a sock brand that comes with comics about the characters (who are the socks). Jim Torok has been making cartoons since he was 4 years old, and put out his own newsletter (circulation of one). His work has been published in magazines and newspapers, shown in movies, on television, and in galleries and museums throughout the world (most notably in the permanent collection of the Metropolitan Museum of Art in New York). If you are interested in finding out more, you can ask him (he is very approachable, and most happy to talk to anyone about his work), or just visit his website – jimtorok.com. Also, feel free to follow him on Instagram or FaceBook (although he does not use Facebook so much anymore). Lauren R. Weinstein‘s highly acclaimed comic strip, Normel Person, can be found at Popula and previously in the Village Voice. Sometimes her work can be spotted in the New Yorker. She has published three books: Girl Stories, Inside Vineyland and Goddess of War. Her latest comic is “Mother’s Walk,” published by Youth in Decline. This entry was posted in Current show. Bookmark the permalink.